I actually have something crafty to show today. I made a birthday present for one of Harper's friends a couple of weeks ago. She requested a dress made with lace. I thought it was sweet that her friend wanted me to make her doll a dress. The best part of it though was I did not spend a dime making it. I used material I had on hand. Gotta love that. I used Simplicity 4786 as a starting point. The back is velcro so it should be easy to get on and off. I didn't get to see her open it, but Harper said she liked it. How exciting - an equestrian American Girl in 2013! 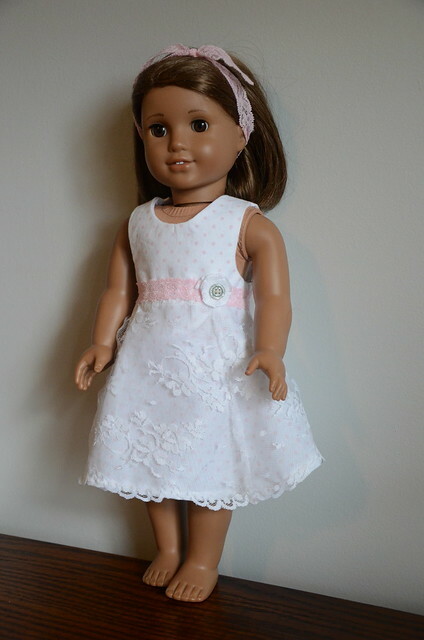 She's sure to be very popular, and we can't wait to sew this dress for her! What a very sweet dress! I'm making my first pair of liberty Jane jeans today- it'll be on my site later this week. I just love doll clothes. (Www,sewsnbows.com in case you're interested) :) what a great way to be involved with her friends too. Good work! Perfection. My girls would adore a little dress like this for their AG dolls! The dress really looks great. It is so fashionable and it fits perfectly on Simplicity. Did you also make one for her?